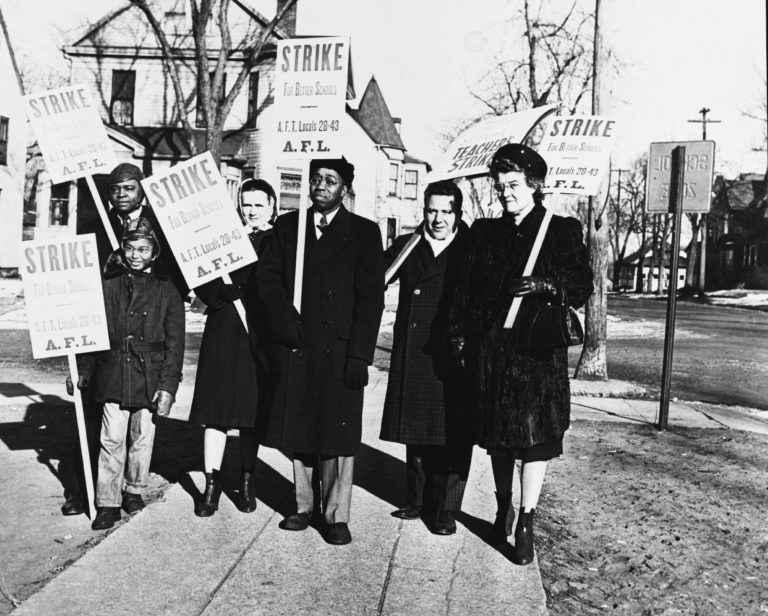 Educators walk the picket line in 1946. Educators fought for the schools our kids deserve during our 2013 contract campaign. 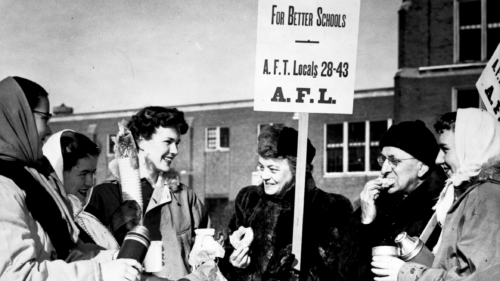 Students served striking teachers hot beverages during the 1946 strike. Members rallied at LEAP High School to support our immigrant students on in January 2017. 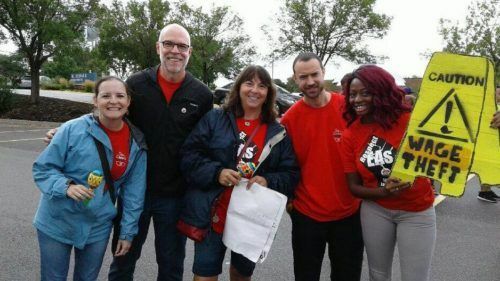 SPFT members on the picket line in 2016 to support the Minnesota Nurses. Our Educational Assistant Leadership Team met for the first time in 2015. 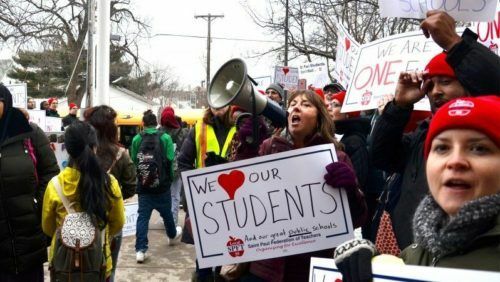 Founded in 1918 as an affiliate of the American Federation of Teachers, the Saint Paul Federation of Teachers (SPFT) has a long history of advocating for policies that improve public education for our students and our members through collective action. SPFT believes teaching is an inherently political act. We encourage and support each of our students to reach their full potential. We do not turn anyone away. In 1946, SPFT members participated in the first organized teacher’s strike in the country. Educators braved a cold Minnesota winter to fight for equal pay for women teachers and for the schools to provide textbooks for students. More recently, we have successfully advocated for smaller class sizes, necessary school staffing improvements, and the use of Restorative Practices in our district, in addition to wage increases. Unfortunately for far too many students, our public schools still do not work. This is especially true for many of our students of color. Our public education system does not have to be this way. Finding the resources to provide a quality education for every child is challenging, but absolutely necessary. We must keep striving for racially equitable schools because the diversity in public schools is one of their greatest strengths. It is going to take all of us creatively working together to achieve the promise of public education. 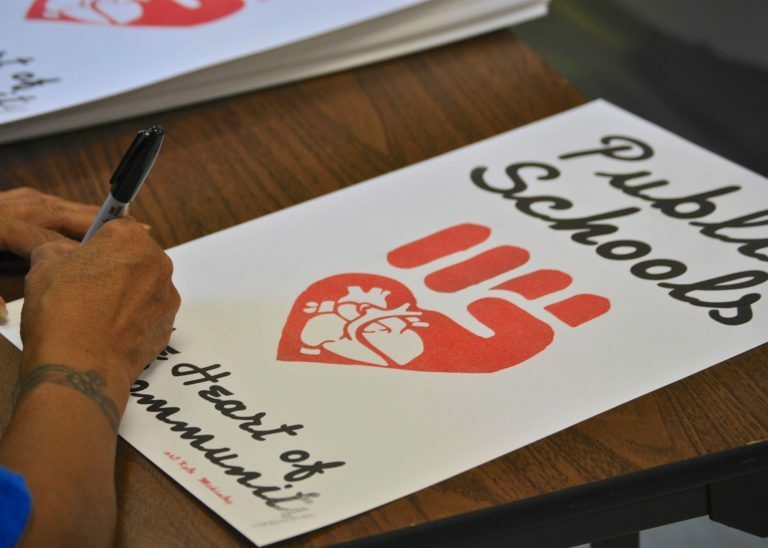 Educators must stand with parents, students, community allies, and our labor partners to fight for fully funded, racially equitable public education. We believe public schools are where we shape our future. Today, the Saint Paul Federation of Teachers (SPFT) is made up of over 3,600 School and Community Service Professionals, Educational Assistants, Teachers and other Licensed Staff who work at over 65 sites in Saint Paul Public Schools. 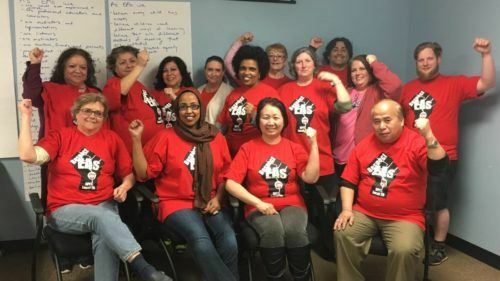 SPFT is an affiliate of Education Minnesota and our two national teachers’ unions: the American Federation of Teachers and the National Education Association. We are a member of the Saint Paul Regional Labor Federation and the Minnesota AFL-CIO. Join us as we stand up for our schools and our students here in Saint Paul!